An abundance of texture and color lead to the Sullenger House entrance. The grounds of our 1870s-era gentleman’s farmstead here in the Napa Valley are planted with the same flowers that may have flourished on this bucolic country estate more than a century ago. A stroll in the rose gardens, surrounded by the architecture of a bygone era, is enough to overwhelm you with a sense of time travel. 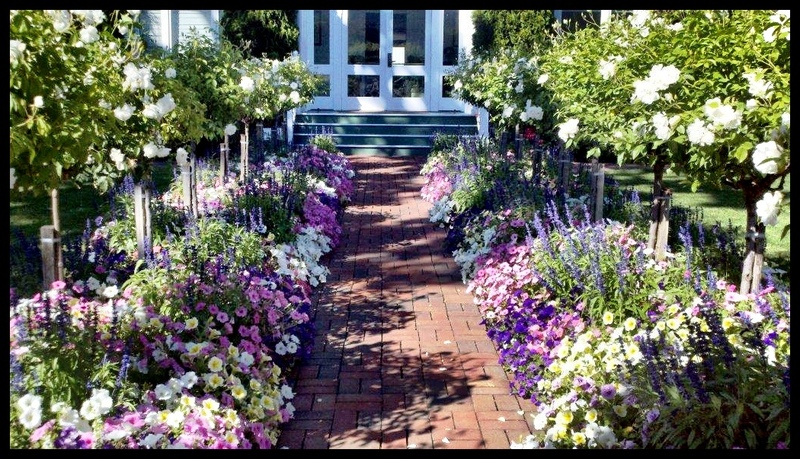 A palette of soft pastel blues, lavenders, pinks and purples blanket the beds around the Sullenger house and main entrance to the winery. Blue and white Victoria Salvias are ready to push their spires ever higher above the waves of petunias, rising like candelabras. Working together with my team and Mother Nature, we form a path connecting the past to the present, with a keen eye to the future. Please join us in the gardens as the days of summer saunter in.